Muawijhe is one of the Dark Apostles (=Chaos Gods) and the Lord of Visions, and his followers tend to go a bit mad. Karnophages are changed remnants of humans that tried to strike deals with His Insanity, and consequently have lost all their marbles and gone completely round the bend. 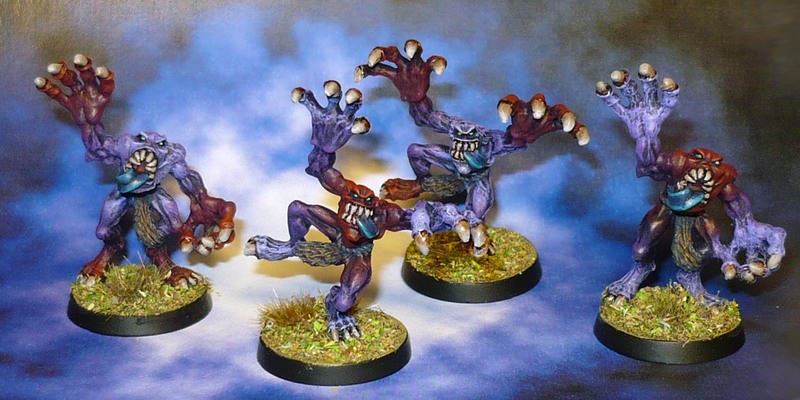 They cavort around the battlefield, tearing into their opponents with abandon. Or something like that. Basically your typical human-sized combat demons/cannon fodder. I also have a few I painted back in the day, these are done in a similar enough fashion so I can make a larger squad if I want.